Case Deal. Buy 6 Bottles for £55.00 each. Rosé Réserve, powerful and stylish. A sophisticated powdery pink rosé, with luminous glints of wild rose. Delicate, vivacious bubbles are the result of an ageing period of over 36 months. A base of 20% of reserve wines, white and red, give this rosé blend a subtle, yet complex nose. The initial fragrances from the 5-6% of elegant red wines are redolent of home-made strawberry jam mixed with the fruitiness of blood peach. 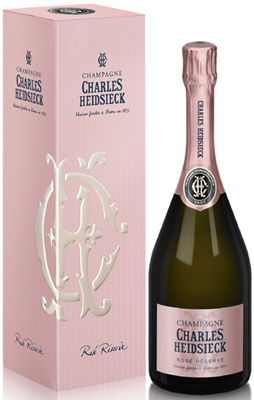 A meticulous selection of crus give the Charles Heidsieck Rosé Réserve the rich warm notes of gingerbread and cinnamon. The deep powerful mouth-feel, the result of ageing in thousand-year old cellars, offers a burst of strawberry, raspberry and blackberry nestled in velvety whipped cream. A deliciously fresh wine which perfectly expresses the complexity of the Charles Heidsieck spirit. Coral-like in appearance, with subtle orange reflections reminiscent of antique roses. Freshly picked strawberry aromas gradually become more intense, with homemade strawberry jam and blood peach alongside rich, warm notes of gingerbread and cinnamon. A vivacious palate full of red fruit, with some generous floral notes. Following a silky-rich texture, the finish is long and balanced. After the first fermentation in stainless steel each tank undergoes malolactic fermentation to soften the natural acidity. After blending with a base of 20% red and white reserve wines, and 5-6% of the Pinot Noir having been vinified as a red wine, the cuvée is bottled and yeast added to begin the second fermentation. The bottles are placed in the cellar at a temperature of about 10°C. In order to achieve the depth and complexity required by the house style, Charles Heidsieck age their Non-Vintage champagne for three years before disgorging, much longer than the legal requirement of 15 months. Charles Heidsieck have built exceptional relationships with the most experienced growers the entire Champagne region. For the Rosé, fruit comes from top villages, such as Riceys, Ambonnay and Ay.